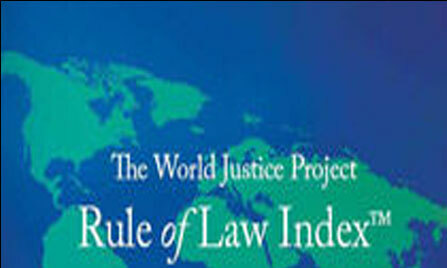 The Washington-based World Justice Project (WJP) has released its 2012 Rule of Law Index, which finds Pakistan as the seventh most corrupt and the top-most insecure nation out of a total of 97 countries assessed. The country also presents a dismal picture in the categories of human rights, civil and criminal justice, regulatory enforcement, check on government powers, regulatory enforcement and openness of the government. The report says that the comparison of the index shows Pakistan scoring strongly on judicial independence and fairness in administrative proceedings. According to the 241-page report, Pakistan shows weaknesses in most dimensions when compared to its regional and income group peers. Low level of government accountability is compounded by the prevalence of corruption, a weak justice system, and a poor security situation, particularly related to terrorism and crime. The country scores more strongly on judicial independence and fairness in administrative proceedings. According to the report, the global ratings of 97 countries, including Pakistan, is assessed in the eight factors, including Limited Government Powers, Absence of Corruption, Order and Security, Fundamental Rights, Open Government, Regularity Enforcement, Civil Justice and Criminal Justice, which all contribute towards rule of law. In the case of Pakistan, out Corruption is 90th. It is 97th (the last) in the category of order and Security; 93rd in the field of Human Rights; 92nd in the areas of Open Government; 91st in the case of Civil Justice; 88th in the area of Regulatory Enforcement; 80th in the factor of Criminal Justice; and 69th out of 97 countries in the factor or Limited Government Powers. The report is a product of five years of intensive development, testing, and vetting – including interviewing 97,000 members of the general public and more than 2,500 experts in the 97 countries. Sir, we had billed them around US$ 2 Billion which we already spent on US war on terror, they have to pay it….so its a political ranking too !! You can improve on it Mr. Zardari! This report is rubbish and baseless.People of Pakistan categorically condemn this false report. and is bundles of lies.Actually America is the No.One corrupted country in the whole world,By aiding through dollars in the shape of so-called Aid to poors is only to get them slaves under the name of rubbish aids. out of 97 countries…pakistan is 7 th most …….not bad…..if u survey more….u'll find many more corrupt nations……. Hope you realise that if Pakistan is 90 th out of 97 countries, then it is eighth, not seventh most corrupt… trying to cheat your way up to the most corrupt rank too, terrible! What a performance Mr. Z & Co? I am impressed. Keep up the bad work very soon we will become NO 1. Mr. Z you are the king of corruption /cheating why don't you bribe WJP to put Pakistan at top. I am most impressed that this country is open to corruption and greed and still manages to have very few honest and decent people that keep this country functioning. I think God must love this nation and one decent man Mohammed changed the Arabs in dark ages. Well,we can all joke about it,talk about it or simply forget about it,but the issue is,this is very serious,nothing to be proud of.Think about what your kids future looks like.If you think that the next new or the same ol government can change everything around in few years so everyone can live happily ever after are mistaken and dreaming.Anf for those who think this report is a sham,get your head out of your a**,its real,all I have to do is look around and think about it,I don't even need to look at this report to know the facts,get real,the sooner you face reality,the better it is.This government,last government,the one before that the one before that,all have the same things in common,first one,they were elected by us the people of Pakistan,two,they are all worthless corrupt people.We the people are to be blamed,we the people need to re-think the way we think and elect officials based on whats important to us not what the guy on the chowk screams about,he's just getting his money and a nice position with the government,he really could careless what you believe. This report is very sad for the Government and the peoples Pakistan. We can't kept on blaming others for false reports. Pakistan People Party can only survive as a national party if they immediately change the top leadership. Pakistan people have no faith in President Asif Ali Zardari as he is considered the most corrupt person on earth by entire Pakistan nation. I think President Asif Ali Zardari alone have done the most damage to PPP than anyone? Way to go Pakistan. Hope you all can cheat your way Haven too…. Currupt nation just fade away,, it is just a matter of time.